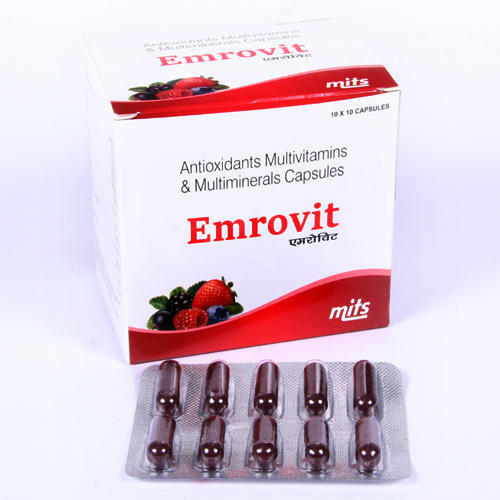 We are the leading manufacturer supplier of Emrovit capsules.It comprises of best quality Methylcobalamin, Alpha lipoic acid, Folic acid Pyridoxine hydrochloride. Founded in the year 2010, we, MITS Healthcare Pvt Ltd, are one of the distinguished names engaged in manufacturing, supplying, distributing and trading of broad range of Pharmaceutical Tablets and Capsules. Offer medicine range comprises of Antibiotics Tablets, Pharmaceutical Tablets and Pharmaceutical Capsules. Available with us at highly affordable market prices, these drugs are known for their accurate composition, precise pH value, optimum effectiveness and enhanced shelf life. Offered drugs are available with us in bulk quantities with tamper proof packaging. In addition to this, we offer Pharmaceutical Franchise in different regions of India. Different pharmaceutical products are already franchised in different parts of Karnataka, Kerala, Bihar, Chhattisgarh, Gujarat, Madhya Pradesh, Maharashtra, Orissa, Punjab, Rajasthan Nagaland and Manipur to name a few. Medical representatives are invited from unrepresented states of India for the franchise of different Pharmaceutical products. Keeping the budget constraint of our customers in mind, we offer them multiple payment modes such as cash, online and invoice. Since the inception of our company, we have been well supported by a team of qualified and experienced professionals. These professionals are selected through rigorous selection procedures conducted by our human resource professionals. In order to avoid any kind of hassles in the workplace, our employees work in close-cooperation with each other. Furthermore, these are trained on regular basis, in order to enhance and polish their technical skills in the most efficient manner.